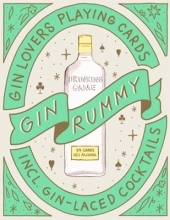 This beautifully illustrated deck of playing cards is perfect for round after round of gin or Gin Rummy – or any other card game. Featuring illustrations of 40 gins from around the world, plus 12 gin-based cocktails, the deck is accompanied by a booklet giving detailed background to the world`s favourite juniper-based spirit, the 40 gins themselves and recipes for all the cocktails. Perfect for a hand of cards or a handy refresher on how to mix a Tom Collins or Twisted Gin Fizz.